Seldom do we get a peek into the greater evil workings of the financial sector, and now we have two. Both of these books matter, because they confirm the worst of our suspicions. For the longest time, corporations have been burying simple truths in endless bureaucratic labyrinths. In the aftermath of the 2008 crisis, we finally remembered that common sense matters too, and that bad investments repackaged into Chinese boxes do not miraculously become good investments. 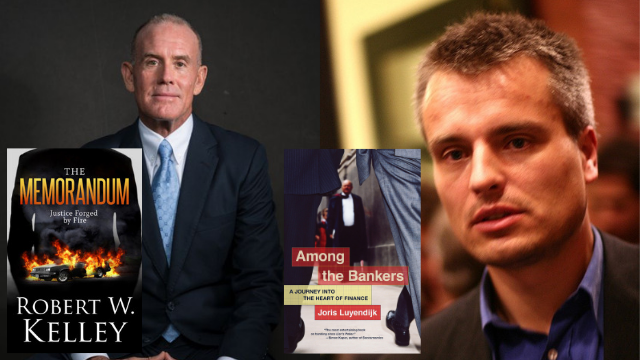 In his book Among the Bankers: A Journey into the Heart of Finance, Joris Luyendijk discusses the issue of whether the world of finance can be reformed and kept in check on a global scale. His conclusions are bleak, to say the least. Robert W Kelley’s upcoming book, The Memorandum: Justice Forged by Fire got me thinking about the same issues. A renowned attorney who has taken on the likes of Philip Morris and General Motors, Kelley exposes the intricate web of corporate cover-ups that led to numerous Americans burning alive in their cars when a simple upgrade to fuel tanks, costing a couple of bucks, could have saved them. Luyendijk’s and Kelley’s journeys through the “belly of the beast” take different forms. To gather intelligence as to who was responsible for the financial crisis and whether bankers are evil, calculating monsters, Luyendijk interviewed dozens of insiders in different areas of finance in the city of London. Meanwhile, Kelley, whose book is coming out on Sutton Hart Press later this year, explored the inner workings of a different beast through his work representing the family of a teenager who was burned alive in a fuel-fed fire while on vacation with his family. After reading these two books almost simultaneously, there is little to say in the shape of optimism. While Kelley shows us exactly how corporations consider lost lives in terms of the cost of potential lawsuits, Luyendijk portrays a global finance world where amorality is the norm and auditors are paid hefty fees by the financial institutions they are supposed to keep in check. For former Barclays CEO Bob Diamond, the culture of a bank can be described in terms of “how people behave when no one is watching”. The same logic applies to other large corporations, like the ones Kelley and his partner John Uustal usually take on. In his book, Kelley offers details about the long and intricate journey he embarked on in order to be able to use shocking internal GM documents as evidence. In particular, he and his firm unearthed a memo that unapologetically explained that the potential cost of lawsuits, if people were burned alive due to unsafe fuel tanks, was about half of what it would cost to make them safer by including a steel casing. Think about that for a moment. As Kelley likes to say, “Let it sink in.” Although we are talking about a humongous corporation here, we are also talking about people. An engineer signed that memo. Human beings received it and decided to go ahead and keep producing the unsafe fuel tanks. One of the problems with corporate misconduct is that these humans seldom do prison time. These monstrous, faceless corporations pay $10 million, $100 million, a billion even; it doesn’t matter. One of the problems with corporate misconduct is that these humans seldom do prison time. These monstrous, faceless corporations pay $10 million, $100 million, a billion even; it doesn’t matter. They sometimes make that much in a single day. One of the most shocking aspects of the 2008 crisis is that not a single CEO of a financial institution went to jail for causing it. Luyendijk’s book tries to answer the question, “How can those people sleep at night?” Because when there is such a crisis, people die. It’s not just about money or greed. People lose their homes, they are unable to afford healthcare, they lose their jobs, people commit suicide; it is very personal, it is not about “the economy”, it is about people and their chance to survive in an adverse environment. Luyendijk concludes that more stringent regulations are not going to make a massive market crash less likely. After interviewing hundreds of insiders, he seems convinced that the culture of banking and finance has to change, because, as one regulator he interviewed put it, “whatever the rules, bankers will always find a way around them.” In other words, their goal is never to do good by clients or investors, or to abide by the rules; the goal is usually to make the most revenue for the financial institution while “not getting caught”. As for the type of corporate misconduct depicted in Kelley’s book, although the verdicts and settlements corporations are being forced to pay in America today are generally too small to put them out of business or to even encourage them to change their behaviour, we have a strong wave of tort reform advocates looking to make wrongdoers pay even less. Considering Robert Kelley’s revelations about American corporations and Luyendijk’s insights about global financial institutions, one conclusion to draw is that we haven’t understood these problems well enough to start thinking about solving them. These types of books are important because unlike those dishonest politicians who will have us believe that the economy is too complex for the layman to understand, they try to put some of the darkest aspects of the status quo in layman’s terms. And while I do not believe that we are close to finding a solution, the kind of understanding Kelley and Luyendijk offer seems like a good first step in that direction. Verónica Pamoukaghlián is an Armenian-Uruguayan writer and award-winning filmmaker. She is a literary translator at Amazon Publishing and a regular contributor for Lento (Uruguay), Brainblogger, and Africa Insider. Her poetry has appeared in The Southern Pacific Review, The Armenian Poetry Project, The Armenian Weekly, Words Fly Away (Fukushima Poetry Anthology), Prism, Naked Punch (London), Sentinel Literary Quarterly (London), Poesia en el subte Anthology (Argentina), Arabesques Review. Short fiction in Book Lovers (Seal Press 2014) and the SEAF Literary Anthology 2014 (Seattle). Essays have appeared on The Acentos Review, Naked Punch and elsewhere.